We are Brad and Mary (and baby Basil now on the outside), family team behind Monarch Acres. 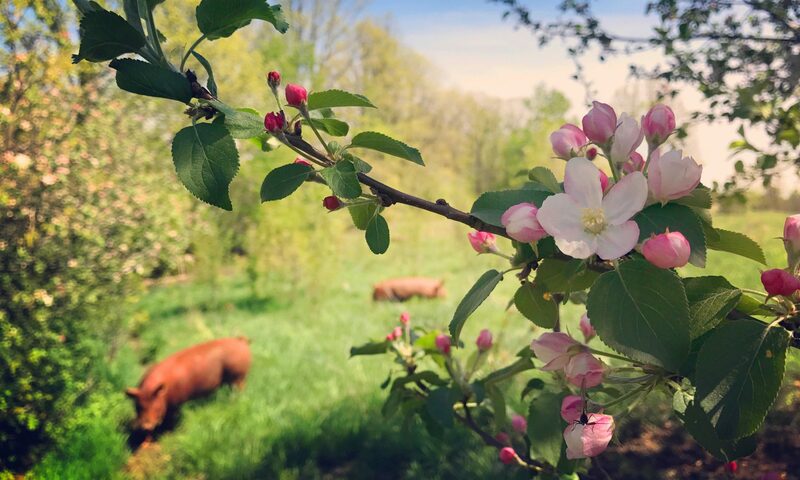 Our main gig here on the farm is producing high quality, nutrient dense meat with a focus on pasture raised heritage pork. Our 35 acre farmstead is located in beautiful Lanark, Ontario just a quick 50 minute jaunt from the city of Ottawa and a 15 minute trot from the old town of Perth. As avid animal lovers, we believe that farm animals can, and should be provided with a life that honours their character, in ways that work in relationship with nature. All of our animals are raised outside using rotational grazing methods ensuring that they always have plenty of space to roam, diverse perennial grasses to forage, ground to root up, and mud to wallow in on those warm summer days. Pasturing methods such as these regenerate the landscape with animal fertilizer while also benefiting the health of our animals and customers. Everybody wins! After one Environmental and Resource Studies degree at Trent University in Peterborough, and almost a decade of working on organic farms and managing livestock pasturing systems, Mary laid down roots on her own farm, continuing to put her passion for animals and nature into action. She’s living her dream! Brads pre-farming career as an alarm technician has helped him adapt to some of the many responsibilities of farm life. He is a problem solver extraordinaire, and can build or fix anything that needs building or fixing. Growing up in the Ottawa Valley with horses and many-a-dog, he was instilled with a love of animals right from the get-go.